Black is timeless. Think black-tie or little black dress. Black goes with everything. When it comes to weddings, however, black typically takes a backseat to white or ivory… but not anymore. 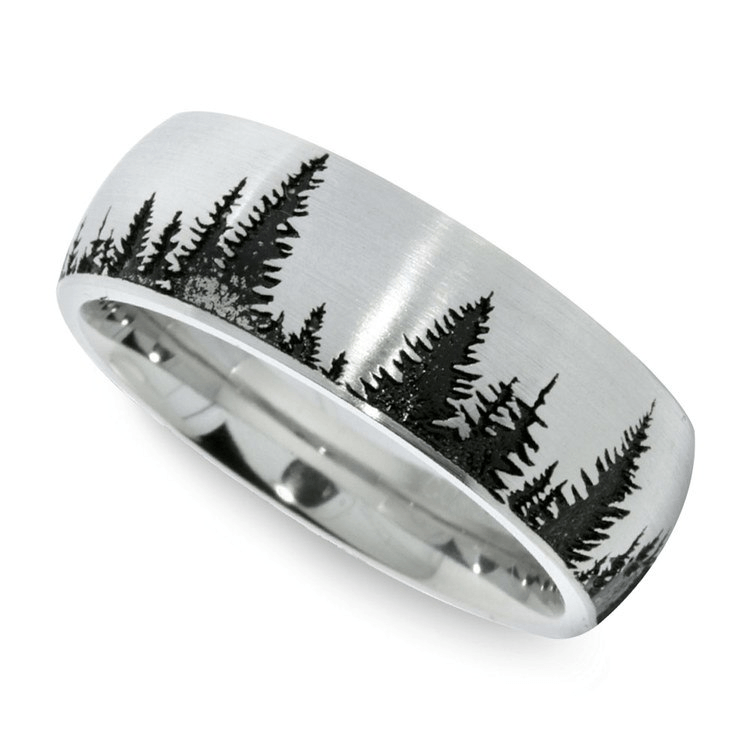 This dark and daring tone is edging its way into mainstream popularity for men’s wedding bands. Yes, black men’s wedding bands are the rage. 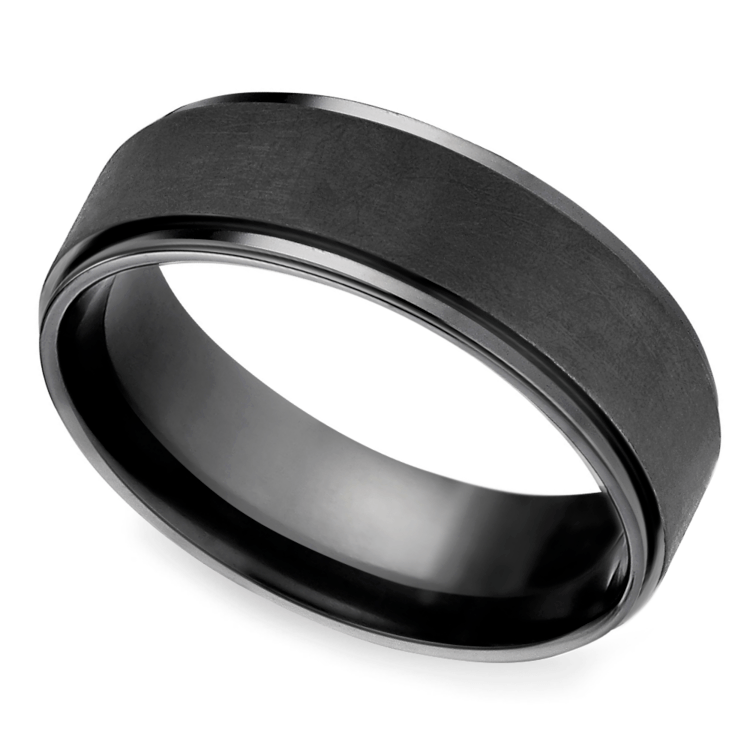 Cool, mysterious and modern, black men’s wedding bands complement casual, upscale and, of course, goth grooms! Black bands don’t just have to compliment a man’s “dark side,” though—black wedding rings come in a myriad of looks, designs, and shapes to fit into his personality and style. Black can be used for inlay accents, to darken the entire band or just to highlight laser cut designs. If his style is more laid-back or casual, you might choose a ring with simple dark accents. Choose sleek silver cobalt rings that feature black laser carved designs or even warm gold rings with dark inlays like rich black walnut or elegant and chic black diamonds. 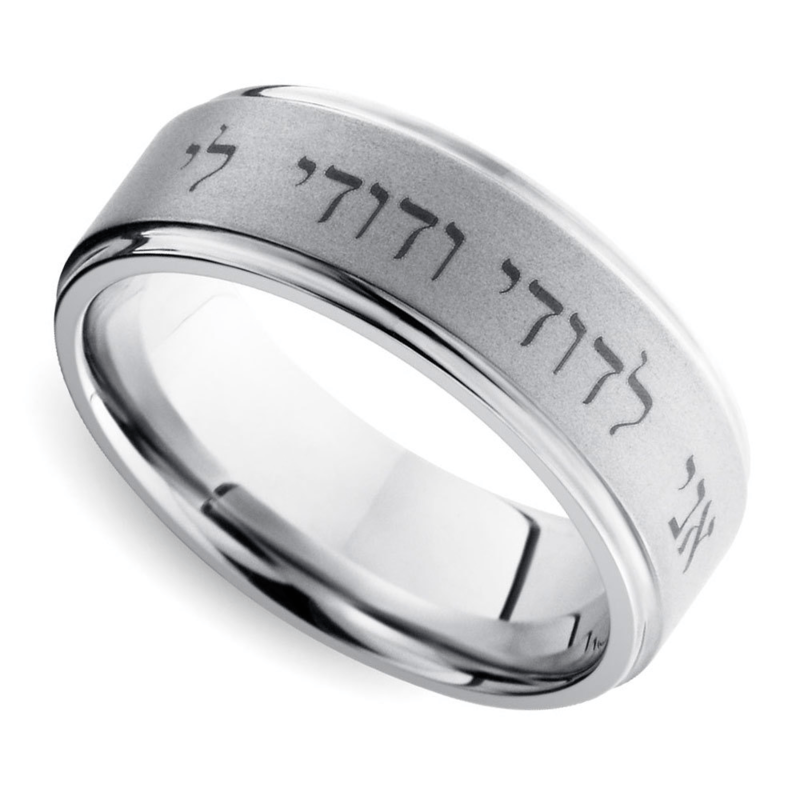 You can also add an engraving in black to your wedding band to make it more personal. Engravings are commonly added to the inside of a ring, but adding text to the outside of the ring makes a much bolder—and romantic—statement. However, black accents also may be found in dark inlays of unconventional materials. The two rings pictured below are a perfect example of the beautiful contrast that can be created with black accents. 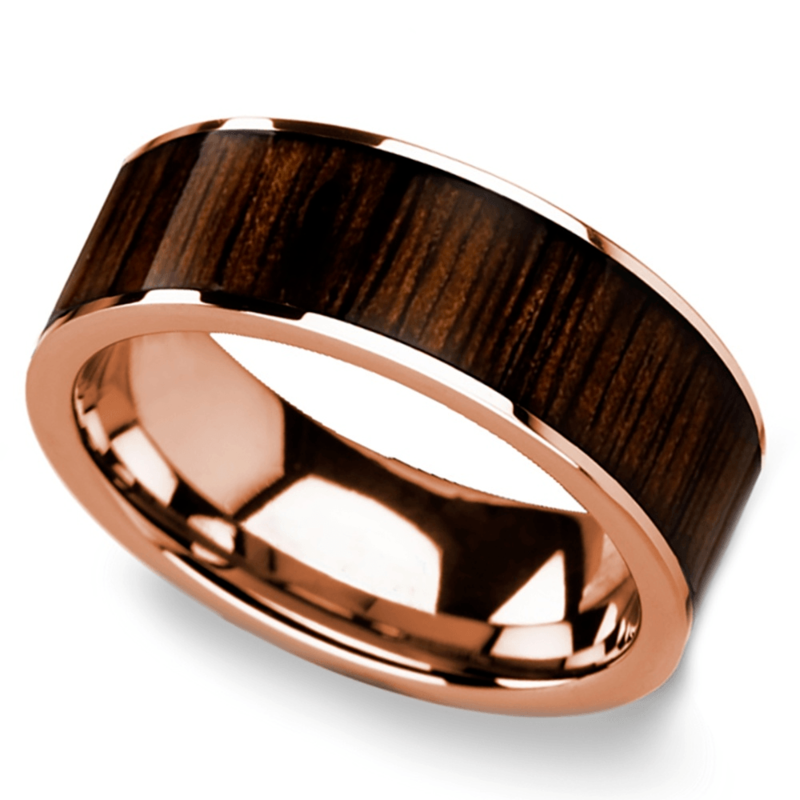 The high polished yellow and rose gold of these rings highlights the unique inlays, creating rings with very distinct personalities: a sleek, modern carbon fiber and rich, classic wood. Black diamonds add an elegant accent while keeping the look sleek and refined. 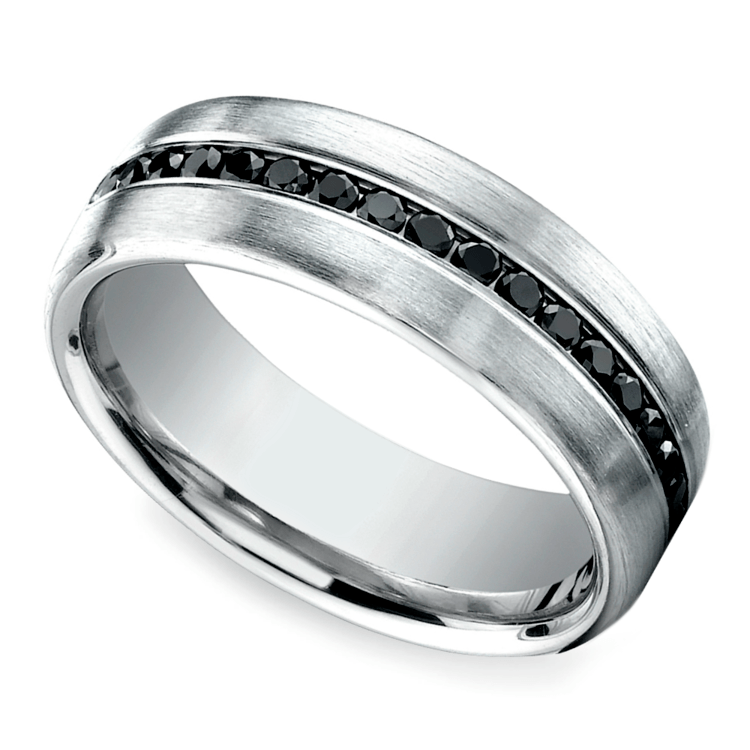 While white diamonds might look a bit more buttoned-up, black diamonds play casually in a men’s wedding band. To let the dark velvet hue of the diamonds pop, be sure to set them against a light-hued metal like white gold, platinum, cobalt or titanium. An all-black men’s wedding band can be designed to display a casual vibe, an alternative nod or even an elegantly modern finesse. Black bands are bold and draw the eye. They command attention and definitely display a unique and amazing appeal. 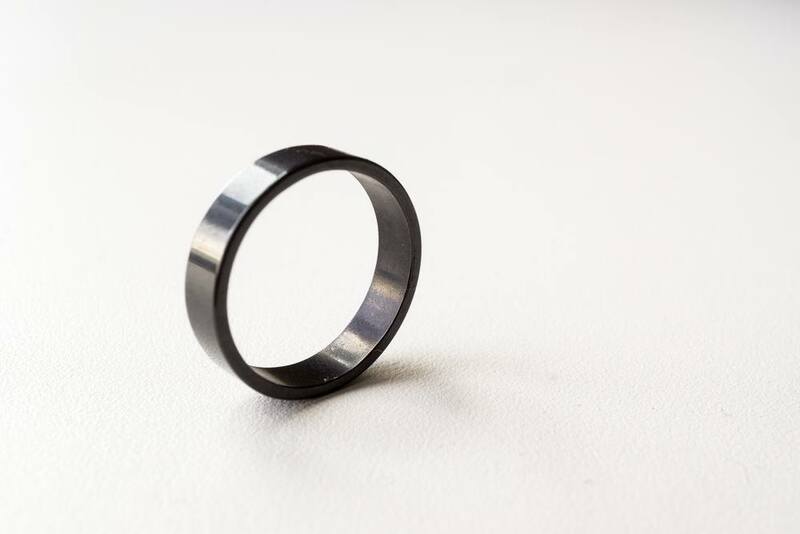 Plain black wedding bands are the ultimate in simplicity and serious style. Choose a plain dark band in ceramic or titanium. A squared-off band looks modern, while a rounder edge is more traditional in style. 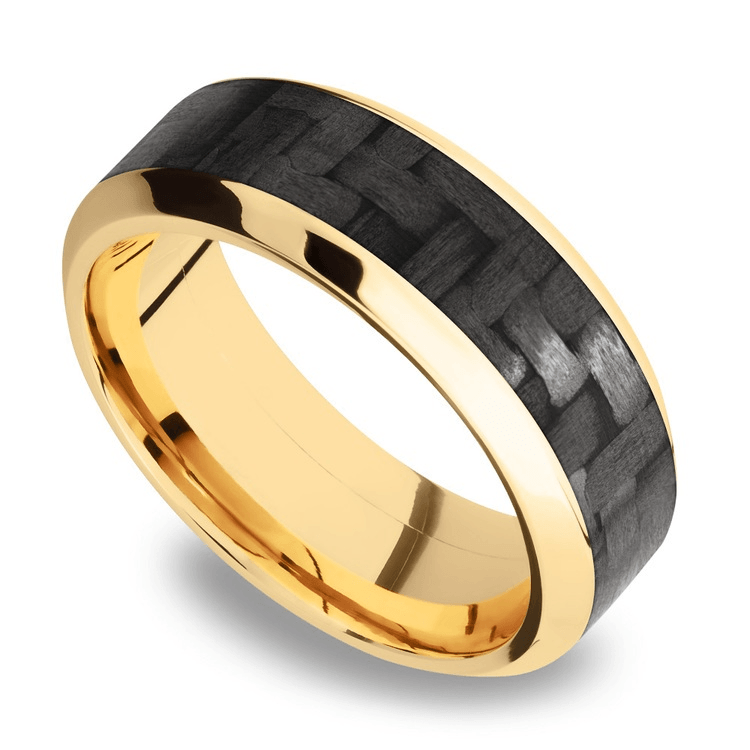 If he wants a black band with a little more flair, choose a ring with a simple pattern or finish. 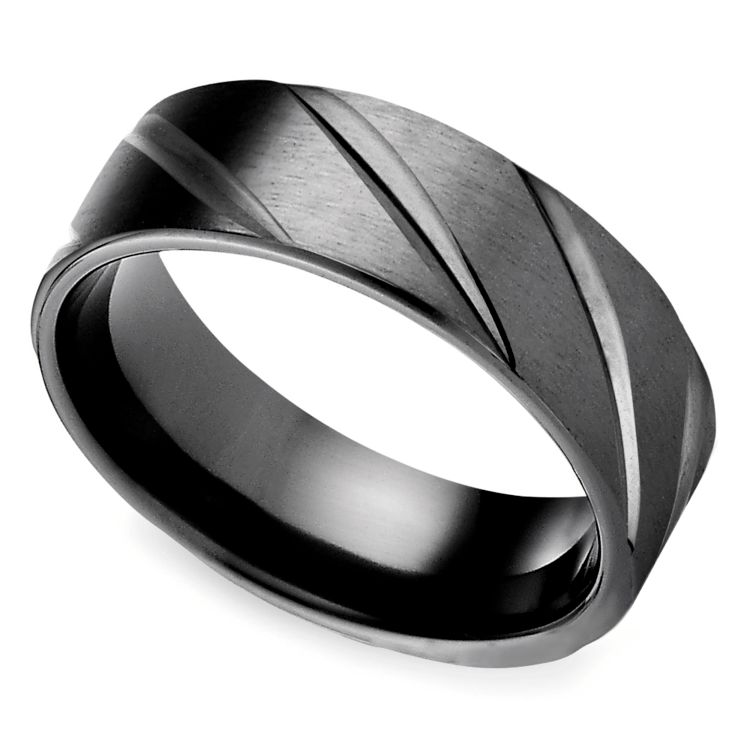 This titanium men’s wedding band (pictured below) is all-black with simple swirl carvings for minimal detail. The comfort-fit design ensures the ring doesn’t cut into his finger. All black doesn’t have to mean zero color, either! Choose a pure black band with an inlay to break up the darkness of the band. Contrasting metals, colorful accents, or even meteorite add a touch of personality to a black band. 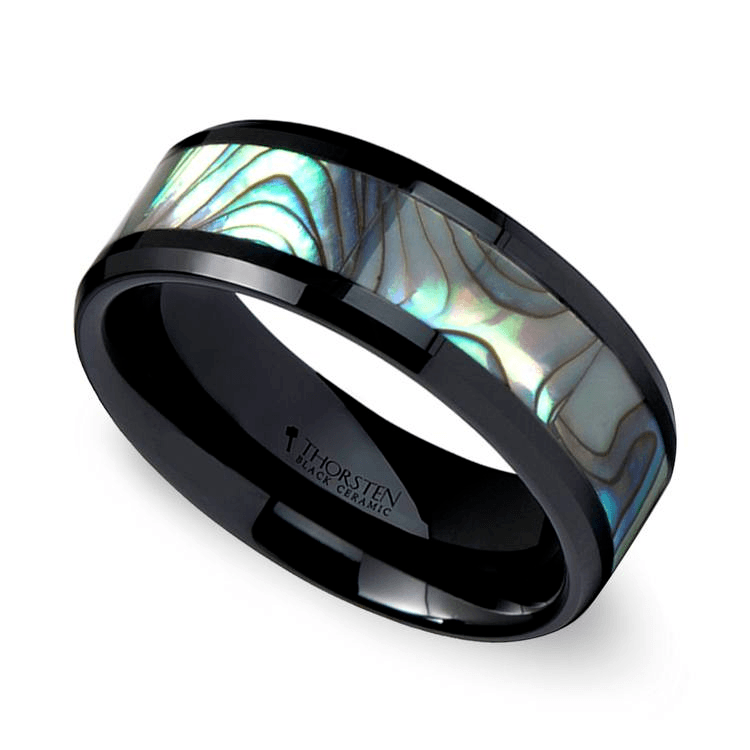 The inlay you choose should incorporate his personality—abalone shells are an alternative to a gemstone and can be worn as a symbol to the sea, and meteorites or dinosaur bone are just, well, cool! 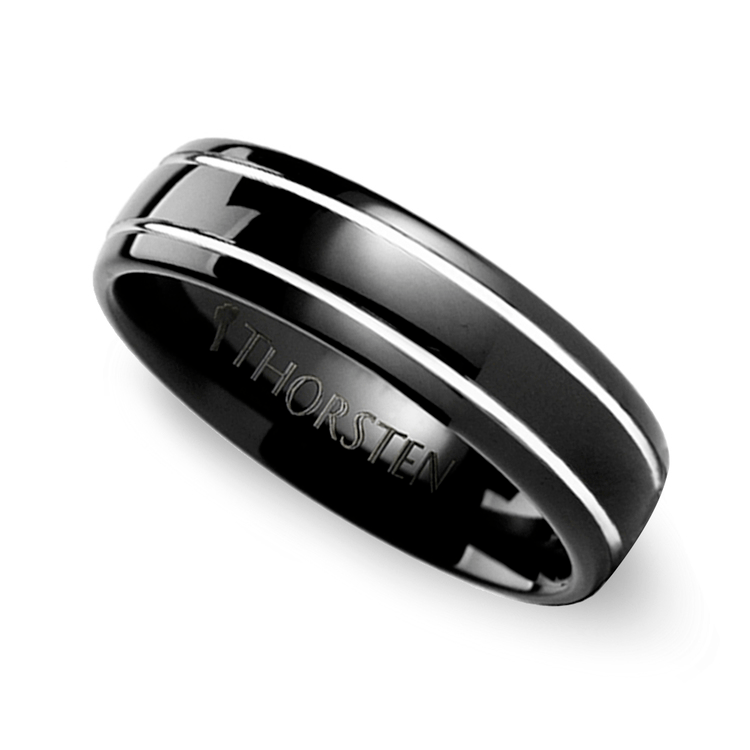 Contrasting metal colors can also showcase the dark hue of a black men’s wedding band. Use accent metals around the edges of a band or in the center to draw the eye to the band. This ring is the most budget-friendly black band (the price is only $105); it’s made of black tungsten and features white grooves. Yes, you also can opt for colorful grooves for budget-friendly accents! Black men’s wedding bands are the newest trend and we predict this laid-back style will stay around for a while. Black is classic neutral, and one of the easiest to wear day after day. 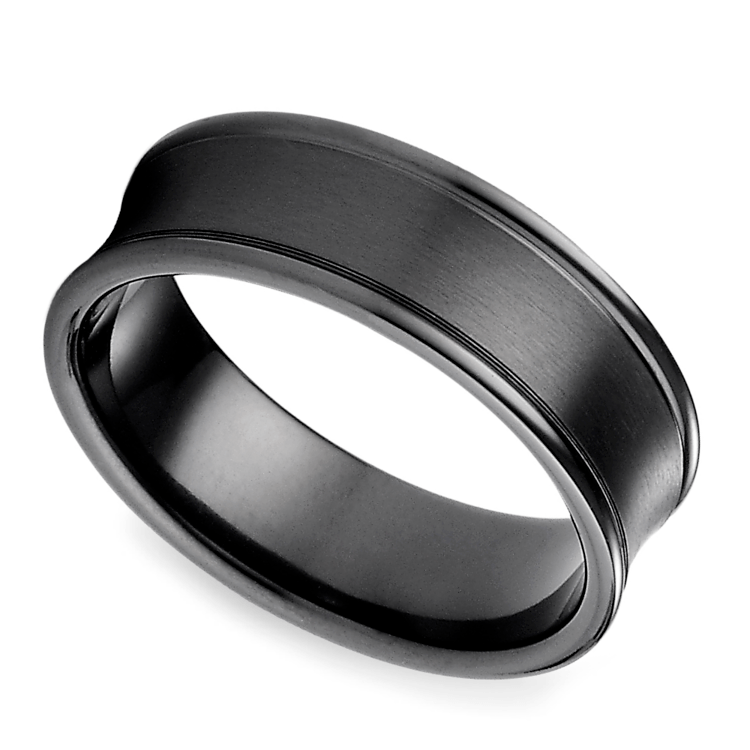 Casual, yet still elegant, black is the ‘it’ color for men’s wedding bands!